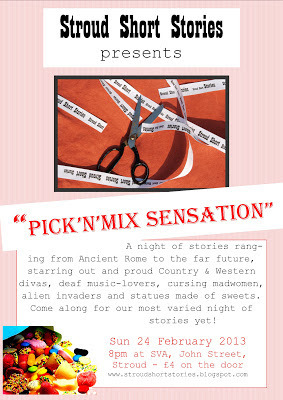 Stroud Short Stories returns on Sunday 24th February for a special night called “Pick’n’Mix Sensation”. There will be ten selected local authors reading their short stories, ranging from Ancient Rome to the far future and starring out and proud Country & Western divas, deaf music-lovers, cursing madwomen, alien invaders and statues made of sweets. Come along for our most varied night of stories yet! The venue is Stroud Valleys Artspace, John Street, Stroud. The event starts at 8pm and tickets are £4 on the door.